Ankle replacement surgery is used to replace arthritis-ridden ankles that have reduced or eliminated the patient’s mobility, prohibiting him or her from working and reducing the quality of life for the individual. This procedure also reduces the risk of deformity caused by arthritis by removing the swollen ankle and replacing it with a surgical replacement. This type of surgery also helps people that sustain injuries to their ankles from skiing, car accidents, ice skating, and other forms of injury. Replacement surgeries for the ankle have become more common in the last decade, with many claiming this type of surgery gave their lives back to them. If you have arthritis, the surgery removes the arthritic joint, thereby removing the cause of pain. After the healing process has completed, any pain in the ankle is minor, allowing you the full benefit that a pain-free, completely mobile life can have. It restores your opportunities of a healthy, active lifestyle, providing benefits to your health in the present and the future. 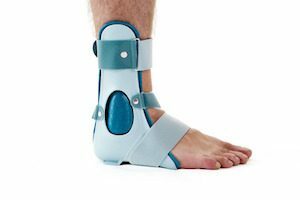 If you have suffered from a shattered ankle due to an accident or trauma from a sport, the replacement ankle will restore the mobility you enjoyed before the traumatic event. This surgery will remove the bone, ligament, and cartilage that is swollen, tender, and immobile, providing greater daily comfort, reduced pain (after healing from the surgery), and a greater quality of life. The doctor will replace the arthritic joint with a metal socket that is placed between the tibia and fibula. The bone is shaped to fit the socket, then screwed into place so that it doesn’t move or shift after the surgery. Finally, bone is grafted between the tibia and fibula so there is reinforcing fusion between the two bones. This provides additional support and stability. When the patient has healed, the socket will serve to provide mobility while replacing the cause of the pain- the arthritic joint. Although relatively simple, this procedure is most beneficial when done under the care and supervision of experienced professionals. If you suffer pain from arthritis and it has reduced the quality of your life due to pain and lack of mobility, contact Michigan Podiatry to schedule a consultation. These professionals have helped hundreds of patients regain mobility and move on to live active, healthy lifestyles. The ankle replacement surgery has helped thousands overcome pain and immobility. You don’t have to suffer anymore. Contact Michigan Podiatry today.